530 Burns Gallery launches into the 2018/2019 season in Sarasota with a comprehensive exhibition, the Season Preview. This group show highlights the work of two artists, new to the gallery’s roster, sculptor Peter Bradley Cohen, and sports artist Heather Blanton. 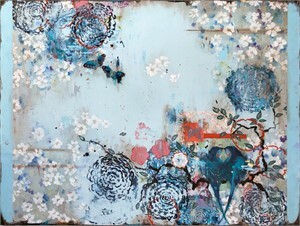 Returning artists Carter Wentworth, Kathe Fraga and Gary Borse amongst others will present new works. The show’s Opening Reception will be held Friday, October 12th from 6-9PM. Some of the themes introduced in this show include masculinity versus femininity in art, materiality, abstraction versus realism, inspiration from nature, and of course, 530 Burns Gallery’s signature bright bold color. 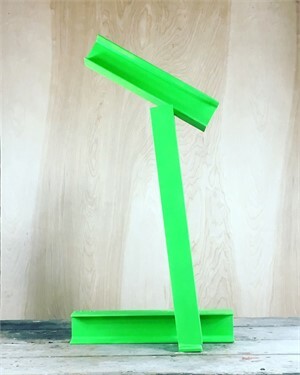 Signaling a fresh start to the 2018-2019 season, this comprehensive group show highlights the work of two artists new to the gallery’s roster-- sculptor Peter Bradley Cohen and sports artist Heather Blanton. 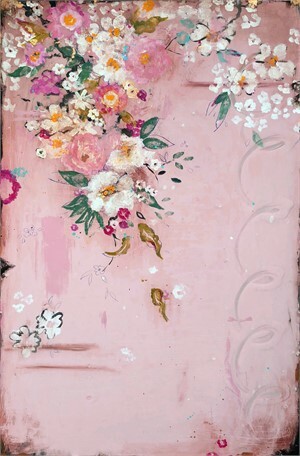 Returning artists Carter Wentworth, Kathe Fraga and Gary Borse among others will also present new works. The show’s Opening Reception will be held Friday, October 12th from 6 to 9 PM. Some of the themes introduced in this show include: abstraction versus realism, masculinity or femininity in art, materiality, movement, inspiration from nature, and of course, 530 Burns Gallery’s signature bright, bold color. This show lays the foundation for innovative exhibitions to come this season. Welcoming the new, 530 Burns continues to develop and show emerging and established artists who bring new ideas to a growing city with a foundation rich in culture. The Gallery itself is located in Historic Burns Court. Developed in 1925 by the prominent Owen Burns (hence Owen’s Fish Camp restaurant), the neighborhood is thriving in modern time while maintaining the original character that makes it so special. 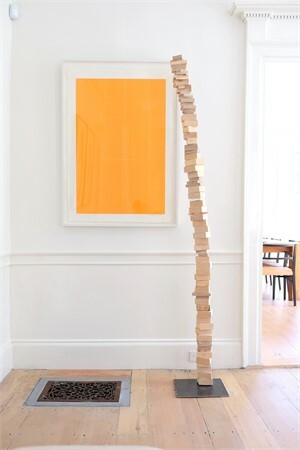 530 Burns Gallery exemplifies the mixing of old and new, and transforming a classical space with sleek, contemporary artworks. It reflects the balance for the Season Preview Exhibition. 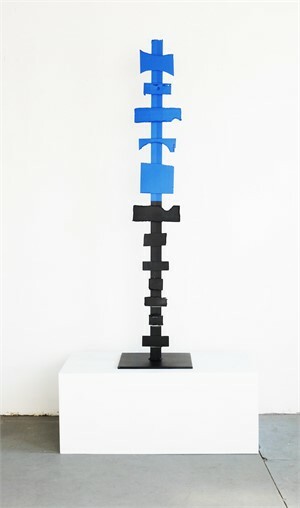 Peter Bradley Cohen’s sculpture makes a bold statement as the Gallery debuts his work in a new outdoor sculpture area as well as inside the exhibition space. 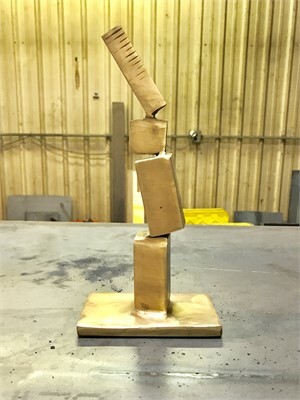 Working primarily with found and industrial materials such as structural steel, his sculpture explores the tension and balance between geometric rigidity and organic fluidity, material weight and the impression of weightlessness. 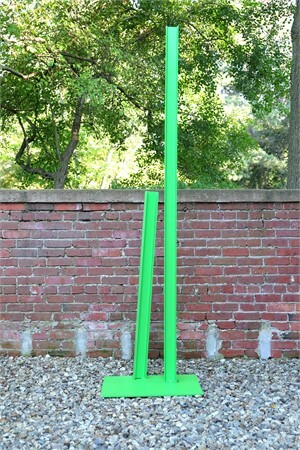 Towering at nearly 7.5 feet, Dance No. 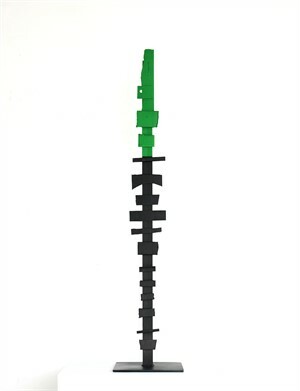 2 captures the eye through its bright green color and abstracted notion of movement frozen in welded steel. Heather Blanton, a Florida native, is best known for her graphite and acrylic paintings capturing the movement of sports narratives. 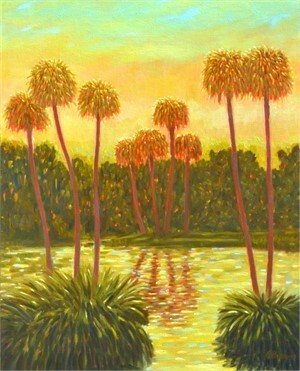 Sarasota is home to an active golfing community, and Blanton’s paintings combine abstract expressionist techniques with the lively sport. Her work is as much a commentary on geometric shapes, lines, and forms as it is on the intricacies of swinging a golf club. Striking a balance between masculinity and femininity, the paintings exude a refined spirit. 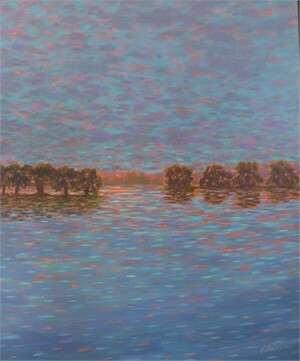 Representing nearly 30 different artists, 530 Burns Gallery begins with a “Season Preview” as a taste of the talents. In turn, by constantly evolving and displaying new, innovative work, 530 Burns Gallery helps clients find pieces that not only fit their collections, but will be cherished on their own for years to come. As more information becomes available, it will be posted here. 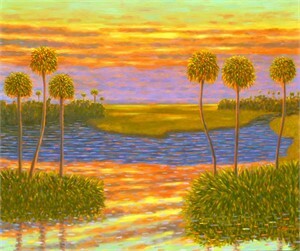 530 Burns Gallery launches into the 2018/2019 season in Sarasota with a comprehensive exhibition, the Season Preview. This group show highlights the work of two artists, new to the gallery’s roster, sculptor Peter Bradley Cohen, and sports artist Heather Blanton. 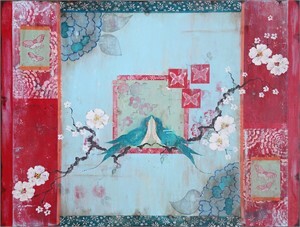 Returning artists Carter Wentworth, Kathe Fraga and Gary Borse amongst others will present new works. The show’s Opening Reception will be held Friday, October 12th from 6-9PM. Some of the themes introduced in this show include masculinity versus femininity in art, materiality, abstraction versus realism, inspiration from nature, and of course, 530 Burns Gallery’s signature bright bold color. Press Release: FOR IMMEDIATE RELEASE: 530 BURNS GALLERY ANNOUNCES “SEASON PREVIEW,” AN EXHIBITION FEATURING A TASTE OF NEW TALENTS “Season Preview” Exhibition Opening Reception Friday, October 12, 6-8PM Signaling a fresh start to the 2018-2019 season, this comprehensive group show highlights the work of two artists new to the gallery’s roster-- sculptor Peter Bradley Cohen and sports artist Heather Blanton. 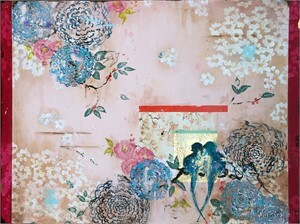 Returning artists Carter Wentworth, Kathe Fraga and Gary Borse among others will also present new works. 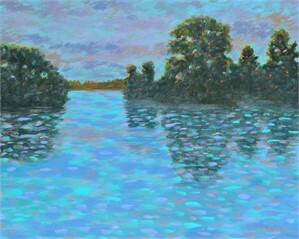 The show’s Opening Reception will be held Friday, October 12th from 6 to 9 PM. Some of the themes introduced in this show include: abstraction versus realism, masculinity or femininity in art, materiality, movement, inspiration from nature, and of course, 530 Burns Gallery’s signature bright, bold color. This show lays the foundation for innovative exhibitions to come this season. Welcoming the new, 530 Burns continues to develop and show emerging and established artists who bring new ideas to a growing city with a foundation rich in culture. The Gallery itself is located in Historic Burns Court. Developed in 1925 by the prominent Owen Burns (hence Owen’s Fish Camp restaurant), the neighborhood is thriving in modern time while maintaining the original character that makes it so special. 530 Burns Gallery exemplifies the mixing of old and new, and transforming a classical space with sleek, contemporary artworks. 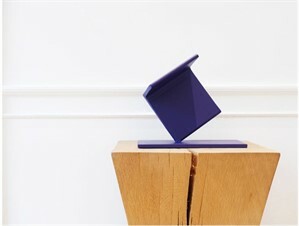 It reflects the balance for the Season Preview Exhibition. 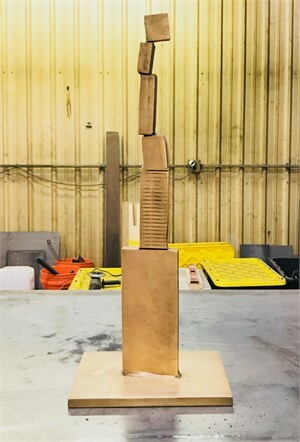 Peter Bradley Cohen’s sculpture makes a bold statement as the Gallery debuts his work in a new outdoor sculpture area as well as inside the exhibition space. 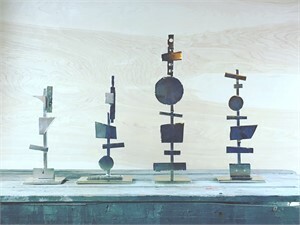 Working primarily with found and industrial materials such as structural steel, his sculpture explores the tension and balance between geometric rigidity and organic fluidity, material weight and the impression of weightlessness. Towering at nearly 7.5 feet, Dance No. 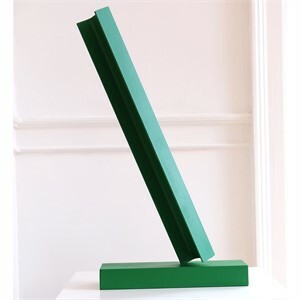 2 captures the eye through its bright green color and abstracted notion of movement frozen in welded steel. Heather Blanton, a Florida native, is best known for her graphite and acrylic paintings capturing the movement of sports narratives. 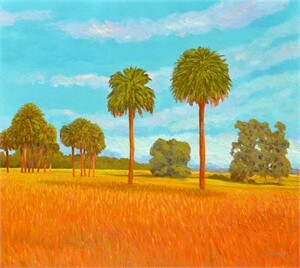 Sarasota is home to an active golfing community, and Blanton’s paintings combine abstract expressionist techniques with the lively sport. 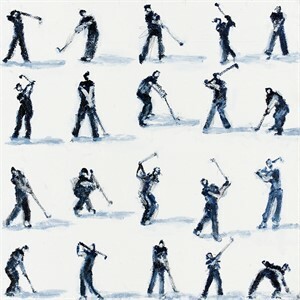 Her work is as much a commentary on geometric shapes, lines, and forms as it is on the intricacies of swinging a golf club. Striking a balance between masculinity and femininity, the paintings exude a refined spirit. Carter Wentworth is a mixed media artist and works with water based paints, primarily British pigments, on thick cotton-based paper. Carter says that for him, “painting is a process of discovery. It’s not premeditated, but a reaction to the first mark I make upon the paper. 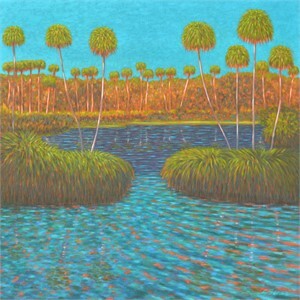 I remain aware of the edges, and the painting becomes an excerpt of a larger imagined space.” Living in Marblehead, Massachusetts and tending to his expansive gardens, Wentworth lets the garden inform his painting and vice versa. 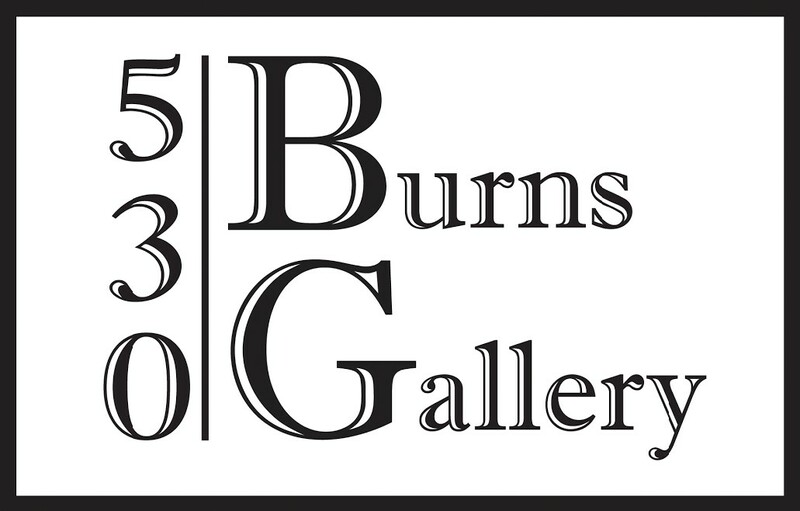 Representing nearly 30 different artists, 530 Burns Gallery begins with a “Season Preview” as a taste of the talents. In turn, by constantly evolving and displaying new, innovative work, 530 Burns Gallery helps clients find pieces that not only fit their collections, but will be cherished on their own for years to come. CONTACT: Molly Lindberg 530 Burns Gallery | 530 Burns Ln. Sarasota, FL 34236 | 941-951-0620 molly@sedacca.com As more information becomes available, it will be posted here.